Caption slip reads: "Photographer: Wesselmann. Date: 1957-11-07. Reporter: Coart. Assignment: Moon eclipse televised from Griffith Park Observatory. 31: Doris Morrow, Hollywood's 'Miss Satellite' looks at eclipse. 1-2-3-6-12: Various scenes on roof of Griffith Pk. Observatory of NBC activity televising moon eclipse. 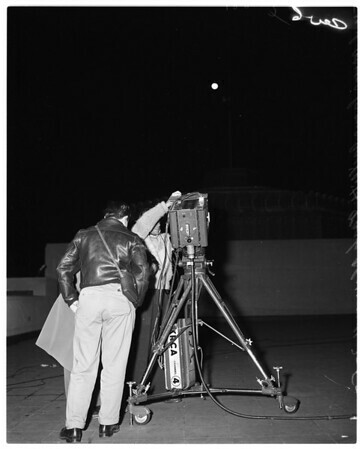 15: Amateur astronomers and photogs [sic] shoot moon phase at half eclipse from top of observatory".